The HARP program was created by the Obama administration as a way to make low cost refinancing a reality for homeowners who have been responsible about their mortgage payments but who have suffered because of the lowered property values created by the economic decline. By refinancing, responsible borrowers can lower monthly payments, reduce their interest, and escape from adjustable rate mortgages and enjoy a stable, fixed-rate mortgage. In other words, the HARP program makes it possible for millions of Americans to take advantage of record-low interest rates, better terms, and much more. There are plenty of things to consider concerning HARP, but the chance to lock in these low interest rates is certainly high on the list. If you've been paying attention to interest rates over the last year or two, you know that they're still at record low levels. It's possible to refinance a mortgage and get some incredible savings. But for many Americans, refinancing seems out of their reach because of things like a mortgage balance that's higher than the actual value of the home. Luckily, the HARP program created by the Obama Administration has made it possible to get refinanced even if you're dealing with a negative equity situation. This program was designed to make it possible for homeowners who don't qualify for a traditional type of loan to get the help they need. HARP allows borrowers to spend time shopping for different rates, comparing terms and lenders in order to find the loan that is best for them. With that in mind it makes sense that finding the perfect loan is important. Since it's something that will change your financial situation, taking the time to shop for the best mortgage refinance rates is important. From knowing how HARP interest rates are calculated to figuring which lender is right for you, there is plenty to remember. VIDEO: How Are HARP Mortgage Rates Determined Today? While there's no question that HARP is one of the best options out there for homeowners in a bad mortgage situation, you still need to remember that finding the best interest rate is a must. Just as if you were looking into a traditional mortgage, finding the right rates is important. Understanding just how loan originators determine what kind of mortgage rate is applied to a loan is important, and while it may seem complex there are a few basic points that can help simplify the process of understanding it for you. There are plenty of charts and graphs that detail the overall rates out there, and just taking a look at charts that detail mortgage rates throughout history is enough to show you just why HARP is more important than ever. The Freddie Mac Rate Trends Survey, for example, displays mortgage rates all the way back to 1971 and shows just how low today's rates are. There are plenty of advantages offered by these low rates, and plenty of benefits offered by HARP. One of the biggest is the fact that recent changes made by the government have actually capped rates and fees for adjustments. This means that borrowers will be much better suited to get lower rates in today's marketplace, particularly since LTV and credit adjustment fees are capped and can't increase or lock one out of their mortgage. Taking a look at graphs and charts will help you see the importance of this cap, how it relates to your mortgage, and more. What Do The Caps Mean For HARP Rates? Those caps mentioned above translate into lower interest rates for your loan. Rates change based on things like economic conditions and trends, and looking at the ways that the economy impacts a mortgage rate is important. But with today's caps in place on HARP loans, getting a low rate is easier than it has been in recent memory. Can I Get A Guaranteed Rate? It's worth mentioning that the shifting, constantly-changing rates mean that getting that perfect rate will be trickier. HARP loans usually take up to 6 weeks in order to be approved, which means that during that time you won't be able to be locked into an interest rate. You may apply while rates are at 3.8%, but by the time you're approved the rates could be 4.2% or even 3.3%. Longer lock periods will increase the interest rate, and in most cases it's important to lock in a rate only after an application is completely approved and ready to be completed. The best lenders will actually keep your application in a 'floating' state until they can lock in the best rate. Good mortgage professionals will be able to float your approval until a good mortgage rate hits, and then lock you in to get you the best possible rates. What's The Best Way To Shop For The Best HARP Rates? Usually, shopping on your own for the best rates isn't always a pleasant experience. Things like shifting rates, confusing rules, and more can easily leave you frustrated. Add to that the more unscrupulous lenders who will promise you a low rate or term and then suddenly change them later and you have a recipe for annoyance. A better option in most cases is to find a qualified lender that you can trust. This will let you relax a bit while your lending professional works to get you a better rate. Look at lending pros that are honest, up front, and can help you get the kind of rates you deserve. It's an easier solution that could help in a big way. There are plenty of questions you may have about a mortgage and mortgage rates, and getting answers could help you learn more about mortgages and getting the best rates possible. What's The Difference Between APR and Note Rate? There are a few terms you'll need to understand when looking into mortgage loan rates, and one is APR. APR is short for 'Annual Percentage Rate' and it refers to the true cost of a loan. This amount is reflected as a yearly rate, and is required to be free from hidden fees or loan rates. It's important to remember that rates may be introductory or even variable, but the APR is still a reflection of cost although it could change. It is also presented in an annual term instead of monthly or weekly. Plenty of other fees and costs may be applied as well, and as a result it's important to look at the APR as a kind of baseline indicator of overall costs. Fees like insurance, interest, discount points, and more will usually be applied to an APR. A note rate is a basic rate of interest on the mortgage and is actually the determining factor in what your monthly rate will be. APR amounts will usually be higher than note rates. In generally, you're better off comparing APR than you are note rates when you start looking for your loan. A few different factors have an impact on the overall mortgage rates, both in general and in specific instances. The Federal Reserve - The Fed and their efforts can have a very direct impact on mortgage rates. For instance, in 2008 to 2009 the NY Fed spent nearly all of its budget doing nothing but buying mortgage bonds. In doing so, they kept rates low. As investors moved away from risky mortgage bonds, the Fed was forced to take over and become the investor. Inflation - Inflation refers to an increase in the prices of goods and services over a set period of time. As the prices rise, a unit of currency will purchase fewer items. Essentially, inflation is a decrease in the purchasing power of money. The higher inflation, the less valuable your money actually is. As a result, lower inflation means lower mortgage rates while increased inflation means higher rates. GDP - The Gross Domestic Product measures the entire country's economic output. High levels of GDP will usually mean higher rates, and in many cases the GDP will lead the Federal Reserve to lower rates in an effort to increase activity in the mortgage market. Unemployment Levels - Higher unemployment leads to lower inflation, which in turn leads to higher bond prices. Higher bond prices mean increased interest rates. In other words, when unemployment rises, so do mortgage rates. Geopolitics - Everything from political elections to global conflicts to natural disasters could trigger lower or higher mortgage rates. In general, unforeseen circumstances will cause rates to fall or climb depending on the nature of the event. It's a common misconception to assume that lenders are the ones who set mortgage rates, but in reality most rates are determined by the Secondary Market. This market is made up of investors who buy the loans that lenders make. The overall activity of the secondary market - whether they're buying, selling, or staying stagnant - will drive mortgages up or down. All of the points above will contribute to mortgage rates changing regularly. Really, rates are nothing more than a reflection of the overall perception of the economy. Mortgages are usually lower risk investments that yield slightly smaller returns than stocks. As a result, they're often seen as safer. That means that they may be more popular during periods when the traditional market is scarier to investors. Mortgage rates are determined by the overall pricing of mortgage bonds and mortgage backed securities. Can I know If Rates Will Go Up Or Down? Generally, you can expect rates to increase in periods of time when the economy is growing or expected to grow because stocks become a better investment than mortgage bonds. 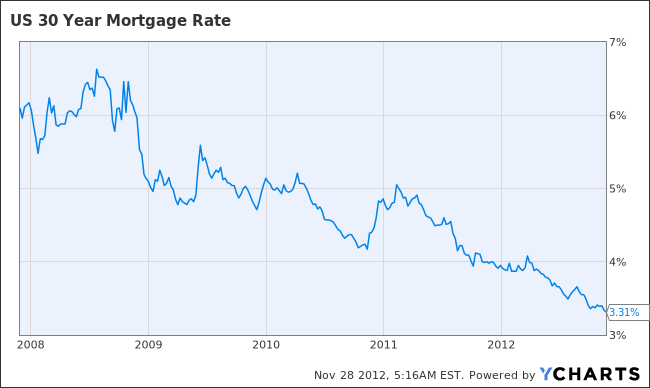 Conversely, when the economy slows down it's likely that mortgage rates will drop. Keeping an eye on the economic landscape is a good idea that will help you know what to expect. Rates can actually change multiple times throughout the day, often in an instant. Of course, they will only change during days when bond markets are trading. You can expect them to stay the same over a weekend, for example. Why Do Rates Increase When The Fed Lowers Rates? When the fed lowers rates, they're lowering short-term rates, not long term ones. This means that mortgage bond holders may not see the benefits of the lowered rate. As a result, the way that rates are impacted by the Fed's actions will vary greatly. Why Do Rates Differ Based On Property Type? Simply put, certain property types are riskier than others. Things like Vacation or investment homes may be riskier to an investor than a primary home, and as a result it's common for second homes or investment properties to have different rates than an owner occupied property. What Can You Use To Monitor Rates? In most cases, individuals won't have to monitor them closely. Your mortgage professional will handle the task for you. However, those who truly want to monitor rates will want to use basic tracking tools available on a subscription-based model. These programs can help a lender keep track of exactly where rates are at any given time, and even alert them when the rate is changing. HARP, also called The HARP Program, the Obama Refinance Program, or the Home Affordable Refinance Program, is a federal program introduced in April of 2009 as a way to help homeowners get their heads above water. The program was designed with underwater homeowners in mind. The big issue faced in the months and years following the economic downturn was the fact that millions of homeowners who had never been late on a payment suddenly found themselves with a loan balance that was actually higher than the overall value of their property. Plenty more now struggle to make a mortgage payment due to dramatically increased interest rates. As a result, these homeowners have found themselves facing stressful, dire circumstances. HARP is intended to help. Basically, the idea behind HARP is to help offer new loans to homeowners that will move them out of interest only loans, adjustable rate loans, or balloon loans and give them lower fixed rate loans instead. The program is also designed so that those with circumstances that would make it difficult or even impossible to get a traditional loan - notably those with negative or no equity - could still take advantage of lower rates and get a solid loan. LTV of 80% or higher. There are no max LTV restrictions, however. The applicant cannot have already been refinanced through HARP before. If those basic requirements are met, the odds are good that you'll qualify for a HARP loan. But why would you want to? The primary reason is simply to lower monthly payments and get a better loan for your home. Other factors exist, too, including things like the fact that it's easier to qualify for a HARP loan than many other loans, that no appraisals are usually needed, and that the process is generally easier and faster than some other options out there. With the chance to move into a fixed rate loan with lower interest rates and lower monthly payments, millions of Americans have taken advantage of the program and helped secure a better financial situation for themselves. However, it's important to understand that the HARP program won't be around forever. Experts agree that a new extension may be placed on the program, but as it stands it will expire in a few more months. Those who haven't taken advantage of it by then will run the risk of being locked into a less than favorable mortgage for good - especially if they can't qualify for a traditional type of loan. Experts have credited HARP with saving millions of Americans and getting them out of a situation that could have cost them their homes. It's also been credited with being a major aspect of stabilizing and improving the housing market and the economy. It makes sense that you should pay attention to what it offers and take advantage of it fully. Call us today @ 866-661-0581 for questions with your HARP Interest Rates.